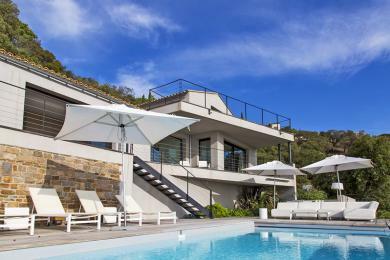 Sophisticated contemporary coastal villa in Les Issambres, Côte d'Azur. One of the most beautiful seaside properties in our portfolio. Views of the Mediterranean are exceptional, especially from the impressive open plan kitchen. Sleeps up to 8 adults and 2 children. The living room is spacious and built in the shape of an L. The living room is beautifully decorated with modern luxurious furniture, a nice sitting area and dining table. An LCD satellite TV with DVD is present as well of course. The kitchen is located in the heel of the L and connects the living room with the dining room. From the dining room there is a beautiful panoramic view over the Mediterranean Sea and the Gulf of Saint Tropez. The modern kitchen is fully equipped including an American fridge, microwave oven and a supersonic espresso machine. The whole villa is air-conditioned. Also, the living room, kitchen and all bathrooms have floor heating. There are 4 bedrooms, all with en suite bathroom. There are 2 bedrooms on the living room level. Bedroom 1 has a double bed (180x200). This en-suite bathroom is equipped with walk-in shower, bath, sink and toilet. Bedroom 2 has 2 single beds (2x90x200) they can be placed against each other. The en- suite bathroom has a walk-in shower and sink. The 2 other bedrooms are one level higher. Bedroom 3 has a full bathroom en-suite (bath, shower and sink) and a double bed (180x200). This bedroom has access to the large balcony at the front of the villa from where there is a magnificent view. Bedroom 4 also has an en-suite bathroom (shower and sink) and sleeps 4 guests. A double bed (180x200) and a bed unit of 2 single beds (2x90x200). The by an architect designed villa lies against a mountainside and therefore consists of several levels. You enter the fully fenced area at the level of the road with an electric gate (with videocamera). There is plenty of room to park on site. At the level of the living room and kitchen is a terrace at the entire the length of the villa. A so-called green area surrounds the villa. This is very good for peace and privacy. The private pool is easily accessible via an outside staircase. The pool has a size of 8,20 x3, 50 meters, and is provided with a so-called counter flow. So you will be able to keep swimming laps unlimited. Except for the high season it is possible to use the pool heating option. At the level of the pool there is an outdoor shower and a toilet. There is also a jeu de boules area. A dining table and other luxury seats and lounge elements adorn the beautiful wooden terrace. A Boretti summer / outdoor kitchen and a seperate bar with professional icemaker complete the luxurious outdoor living. Due to the open structure of the terraces and balconies we consider this villa is not suitable for children aged below 5 years. With the car it takes you 5 minutes to get to the village of Les Issambres located on the coast between Sainte Maxime and Frejus. From the airport in Nice, you are normally an hour driving by car to arrive in Les Issambres. Les Issambres and Sainte Maxime are known for their vast sandy beaches. In Les Issambres there are several good restaurants. Belonging in the favourites is 'Le Provencal / Les Muriers' with its beautiful terrace under the plane trees. In Cap Mail, you have a beautiful sea view while eating fresh seafood. Prices are including VAT and energy cost (normal consumption). * Cost for 1 week stay. A detailed offer will be displayed when choosing an arrival date and your travel party. Note: for a stay longer than 1 week, the cost for the service package will only increase to a limited extent. The villa is not really suitable for children between the ages 1 to 5 years as a result of height differences both within and outside the villa. So in this villa children aged 5 years and older are warmly welcome. Babies are also very welcome. There is table tennis and a jeu de boules area on site. Pool: Private Pool size: 8.20 x 3.50 m.
Pool water treatment: Traditional pool chlorination Depth pool: 1.80 m.